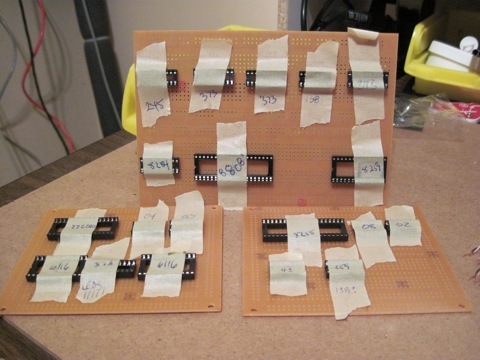 The time has come to clear some space on my breadboard so I can continue to build out the remainder of the system. I’ve collected a few prototype boards from Futurlec by tossing a few in each order over a few months. I bought a few different flavors of boards (PROTO777, PRBRDLG, and EXPBRD) to see which worked best for my random projects. 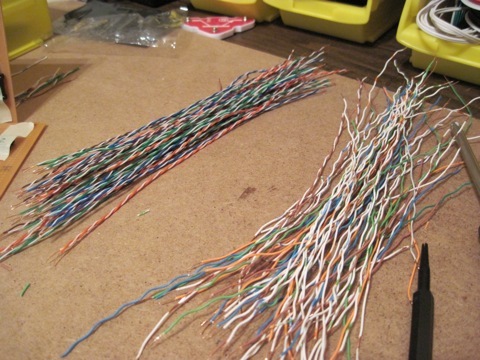 Step one was to create a few more bundles of jumper wires to use. I don’t buy jumper wire kits, instead I keep a roll of CAT5 cable and cut off lengths I need, strip off the casing, and make my own jumpers. I’ve gone through about 40 feet of cable so far on the retro pc project. Fry’s usually has 25, 50, and 100′ bulk cat5 bundles in their networking aisles for reasonable prices (definitely cheaper than the jumper kits in the components aisle ).